SOUTHAVEN, Miss. — A sea of more than 50 flame red pearl Mack Granite dump trucks fill the yard at V McGee Trucking, Inc. in Southaven, Mississippi. Venesia McGee founded the company a decade ago, and it has become a leader among woman-owned businesses in the region. V McGee, located just south of Memphis, Tennessee, hauls materials for projects such as taxiway and hangar reconstructions at Memphis International Airport, and construction projects for Southaven High School, Budweiser, St. Jude Hospital, Beale Street Landing, Norfolk Southern Railroad, and numerous state highways in East Arkansas, North Mississippi and West Tennessee. So, when the company decided to upgrade its fleet, they knew they wanted equipment that could handle the rigors of the job while still being agreeable to the drivers. Operations manager and truck foreman Kevin Mays obtained five trucks from different manufacturers — and allowed drivers to demo them for a few weeks. “It didn’t take long for us to realize that what the drivers wanted was to operate Mack Granites,” Mays said. Mays said every driver told him the same thing: The Mack had more legroom and was the most comfortable of all the trucks. Still, there were two other aspects to address: power and pricing. The drivers had previously used Allison transmissions, and they weren’t sure they would get the power they needed from Mack’s mDRIVE HD automated manual transmission. Customer service was also crucial. 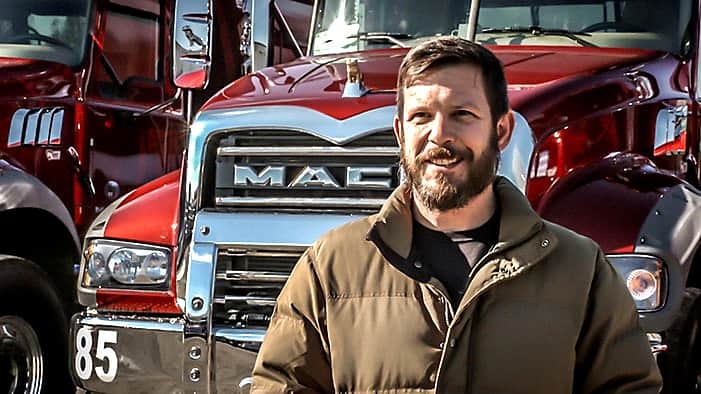 Mack sales executive Robert Blake at Tri-State Truck Center in Memphis answered all their questions – and over the past two years, V McGee has purchased 77 Granite models, with 45 financed by Mack Financial Services. Not only was Blake able to offer competitive pricing, he’s also easy to work with, according to the customer. If V McGee decides to sell the trucks, MFS can get the titles and paperwork together within 24 hours. “We are light years ahead of the bank,” Blake said. Blake held a two-hour breakfast training session with V McGee’s 44 drivers and explained the differences between Allison and mDRIVE HD transmissions so they would know what to expect performance-wise and how to benefit from the mDRIVE HD’s features. Because the Allison has fewer gears, drivers weren’t sure what to expect from the mDRIVE HD. But with the training and some practical application, they quickly adapted and came to value the mDRIVE HD’s advantages. The increased torque capacity of the mDRIVE HD helps performance and optimizes fuel economy through skip shifting. V McGee is currently running 2016 Mack Granite dump trucks, powered by 445-hp Mack MP8 engines and mDRIVE HD transmissions. Mays opted for the mRIDE suspension, which makes driver comfort a top priority through its extreme articulation, maximal traction and improved stability. He chose the Pedigree package for the interior. And over the past 20 months of operation with the trucks, things have gone smoothly, Mays says. Mays appreciates Mack’s customer service department and the way his problems are handled quickly, reducing downtime and expense. Mays also credits the fleet’s success to its dedicated employees and a close relationship with Ox Body, its dump body supplier. The trucks are paying off. V McGee has worked on almost every major project in the city of Memphis and reliable equipment has been paramount in securing new business and stepping in where their competitors are falling behind. Failures have become a distant memory and Mays no longer loses valuable time to clutch and axle issues. content marketing, Mack Trucks, Memphis, Mississippi, Randall-Reilly, Southaven, Tennessee, truckers, trucking industry, V McGee. Bookmark.